Beautifully milled and carved to imitate pepper tree wood, this crook is truly one of a kind. Made of a single piece of sweet chestnut that is bent, slightly scorched and highlighted with a satin finish. Each crook is handmade in Germany from natural materials, so variations will occur. Height is approximately 54 inches and includes a nickel-plated ferrule at the bottom. We are certain you will appreciate the quality and uniqueness of this one-of-a-kind item! Sweet Chestnut (Castanea sativa) is harvested from special plantations in Europe. Most crooks are made from chestnut shoots approximately three years old. The process for creating wooden crooks is one that has remained largely unchanged for centuries. After shoots are harvested, the bark is hand peeled and the wood is dried for three months. After the drying period, the sticks are steamed until the wood is pliable, allowing them to be bent into the shape of a crook. Many of the tools used to bend the sticks have been passed down from generation to generation. After the bending process it's back to the drying chamber before finishing touches are added. Each crook is created by hand, which guarantees a unique and beautiful product. I just ordered this with the milled crook hoping I finally could get a useful alternative to the heavy and shortlived Jeffer's crooks. Although nicely balanced and beautifully carved it cannot hold my 140 lb ewes, it is just too small. The Kiwi or Aluminum crooks are the correct size but their material is inferior to this chestnut. 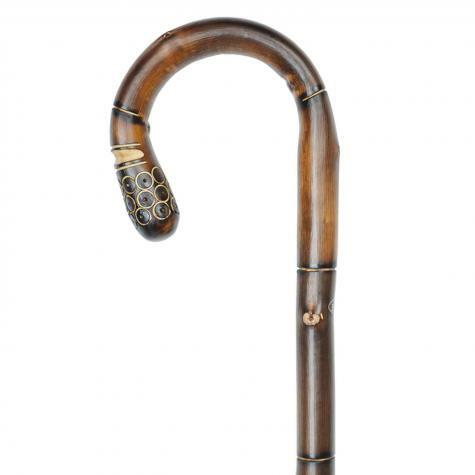 I have been looking for a shepherd's crook for years, to use as a hiking stick. I bought the pepper stick chestnut shepherd's crook, and am very happy with the purchase. The stick is exactly what I was looking for, and I plan to enjoy it for many years. For the price, this item is a tremendous value. 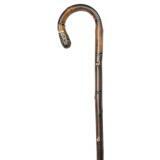 I would enthusiastically recommend this product to anyone who has an interest in shepherd's crooks or hiking sticks. 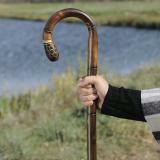 I love my chestnut crook walking stick. 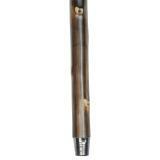 I make walking sticks for others but never a crook. I've always wanted one. I will be buying one for my friend who is a quite the hiker. 50 bucks which included shipping is a steal for such a nice piece of art and these crook sticks are pieces of art, no question!